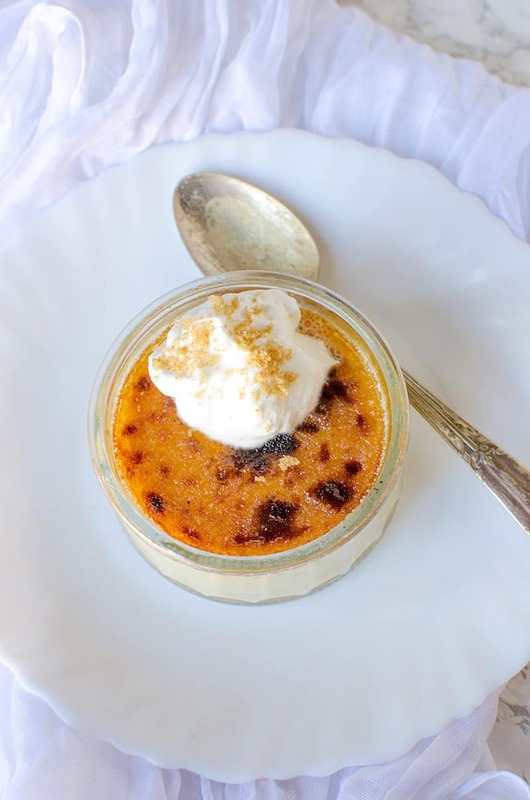 The crispy, burnt sugar is the best part of this easy and delicious eggnog creme brulee. 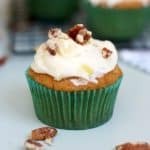 This is perfect for an elegant Christmas dessert! Confession time: I’ve never been a huge fan of eggnog. At least, drinking it straight out of the carton. Having said that, I LOVE eggnog as ingredients in Christmas desserts such as cookies, breads, etc. 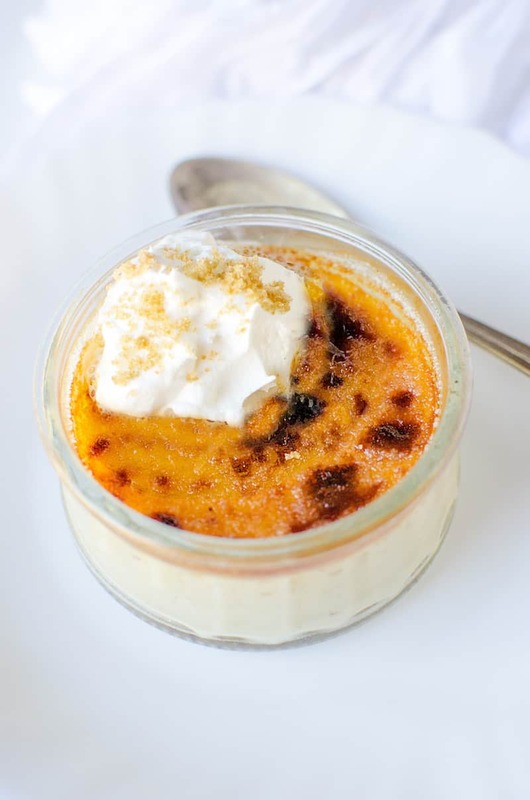 . . and that includes this eggnog creme brulee! 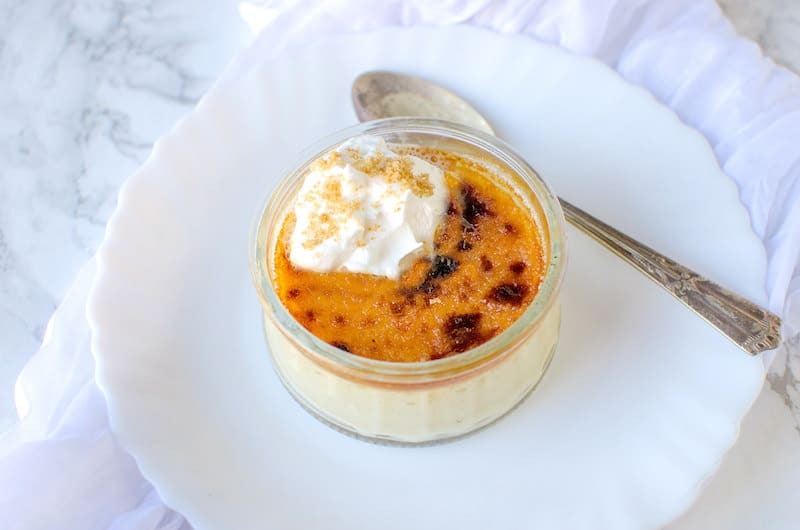 This eggnog creme brulee is perfect for Christmas with its obvious seasonal flavor – however I’m always inclined to make desserts like this around the holidays anyway. 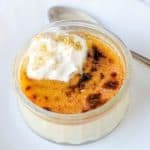 This brulee seems a bit more special, and I love making special Christmas treats that I don’t have any other time of year. 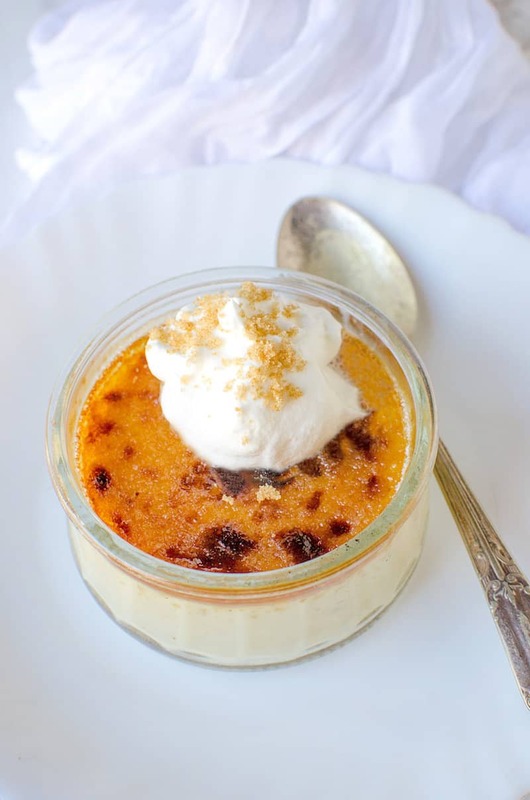 You’re going to love the creamy, delicious filing and the sugary brown crust that a creme brulee recipe should have. It’s pretty amazing! 2. In a pot, combine the whipping cream, eggnog and half and half. Slowly bring to a boil. Once it comes to a boil, remove from heat. 3. In a bowl, whisk the 3 yolks and 1/4 C sugar together. Add the vanilla. 4. Add a 1/4 C of the milk mixture to the eggs, slowly, all the while whisking (temper the eggs). 5. Very slowly, add this mixture back to the milk in the pot while whisking the entire time. 6. Pour equal amounts into four ramekins and place ramekins in a shallow baking dish. 7. Pour the boiling water into the baking dish, around the ramekins. Keep pouring until the water reaches half way up the sides of the ramekins. 8. Bake until the center is slightly giggly still (about 40 – 45 minutes). Remove from oven and refrigerate until set (a few hours). 1. Turn the oven onto broil and measure out 1/2 cup sugar. 2. Spoon some of the sugar onto the top of a ramekin. 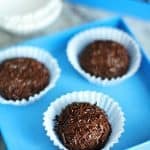 Tilt the ramekin to spread the sugar all over the top, and then pour the excess sugar into the next ramekin and repeat the process. Add extra sugar if you need it. 3. Place the ramekins in a baking dish and set them very close to the broiler. Watch these constantly as they will burn in a flash if you don’t. 4. When the sugar has melted and begins to turn a dark amber, remove from the oven and let cool slightly. 5. 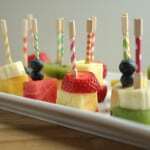 Serve with a dollop of whipped cream or small fruits if you wish. Enjoy your eggnog creme brulee! In a pot, combine the whipping cream, eggnog and half and half. Slowly bring to a boil. Once it comes to a boil, remove from heat. In a bowl, whisk the 3 yolks and 1/4 C sugar together. Add the vanilla. Add a 1/4 C of the milk mixture to the eggs, slowly, all the while whisking (temper the eggs). Very slowly, add this mixture back to the milk in the pot while whisking the entire time. Pour equal amounts into four ramekins and place ramekins in a shallow baking dish. Pour the boiling water into the baking dish, around the ramekins. Keep pouring until the water reaches half way up the sides of the ramekins. Bake until the center is slightly giggly still (about 40 - 45 minutes). Remove from oven and refrigerate until set (a few hours). Turn the oven onto broil and measure out 1/2 cup sugar. Spoon some of the sugar onto the top of a ramekin. Tilt the ramekin to spread the sugar all over the top, and then pour the excess sugar into the next ramekin and repeat the process. 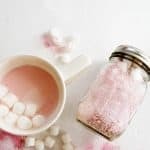 Add extra sugar if you need it. Place the ramekins in a baking dish and set them very close to the broiler. Watch these constantly as they will burn in a flash if you don’t. When the sugar has melted and begins to turn a dark amber, remove from the oven and let cool slightly. What do you think of this delicious Christmas dessert? Please let me know in the comments!